The Spot hits a number of key areas: it's the best designed of the Echo range, giving it immediate appeal. Whether in the bedroom, on a kitchen worktop or side table in the living room, the Spot fulfils its role as master of all. But you might want to wait for one of Amazon's famous Echo discounts before buying. Alexa has liberally thrust itself into the lives of just about everyone. Amazon's omnipotent AI appeals not only to the technically minded, but to everyone. Amazon's voice-controlled virtual assistant, Alexa, has become the complete smart home influencer: everyone wants to work with Alexa and if you don't, you basically don't exist. Part of the secret to this meteoric rise has been variety, with a wide-range of Amazon Echo devices to suit all needs and requirements, whether speaker-focused with the Echo, assistant-focused with the Echo Dot, or screen-focused with the Echo Show. But it's the Echo Spot that's probably the most exciting of the lot. Design is a winner with the Echo Spot. About the size of a softball, it's like a cross between the Echo Show with the Echo Dot. But the design is softer, rounder and altogether more accomplished than either of those mentioned devices. The reason for this is that the Echo Spot seems destined for the bedroom. Yes, technically it can be placed anywhere in the house, but it looks and feels like a bedside device - and it's so much better than the Echo Dot you might already have next to your bed. The front is dominated by that 2.5-inch (diameter) display, while the top houses the four-microphone array and the volume and mute buttons. Sitting just over 10cm tall it doesn't take up a lot of space, so it's easy to squeeze into the smallest of Alexa-lacking places. Sound is delivered from openings in the bottom, which is where the speaker sits. Setting up the Echo Spot is simple and in some ways easier than other Echo devices, because you get to use the display rather than only the app. You simply have to plug it in, identify your Wi-Fi network and put in the password, then sign into your Amazon account. You'll be asked a few questions during setup, but it's a quick and simple process - especially if you're already an Alexa user. Everything you've setup in Alexa will work with the Echo Spot, so any skills you've enabled or services you've connected will be immediately supported. 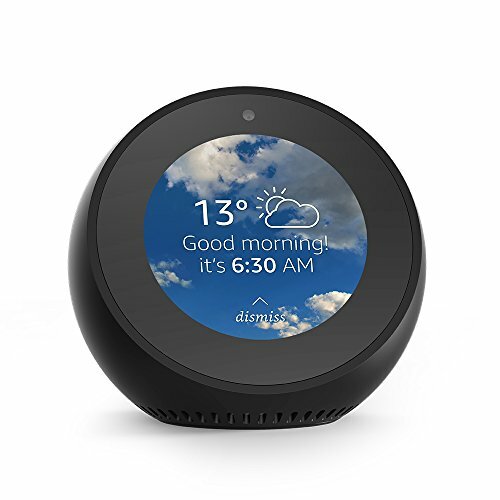 Beyond that, the Echo Spot offers the same audio connections that you get on the Dot and the new Echo models, with a 3.5mm line-out that can be used to connect to existing audio equipment, as well as Bluetooth in case you want to wirelessly connect to an existing speaker. That adds audio prowess that otherwise lacks in an Echo Dot, but if you are deploying the Echo Spot in a bedroom then you might think that unnecessary. That said, half the appeal of Echo devices is versatility - and if it's an audio connection you want, it's there for you to use. Wired works better, however, because you can also use that with Amazon's multi-room grouping feature. The other thing to note about the Echo Spot is that it supports both voice controls (as all other Echo devices to) as well as touch. Like the Echo Show, you can tap to access things like settings, swipe to see other details on highlighted stories or to skip music, and so on. In many cases it isn't essential and if you want to talk to the Spot instead, that's perfectly fine too. Having settled in with the Spot for most of the year, we've rarely touched it - it just seems unnecessary - and as a beside device it has been there to answer questions, control lights in other parts of the house and importantly, show the time. We found the voice control to be good, those four microphones ensuring our commands could be heard from across the room with no problems. Amazon hasn't declared what size or arrangement the speaker in the Echo Spot offers, but having listened to it for some time it's certainly better than the Echo Dot. While we'd say that the Dot isn't really primed for music listening, the Echo Spot is actually passable. Don't get carried away though, as this isn't a fully-fledged speaker. The Echo Show, Echo Plus and new Echo will offer better sound quality (in that order). Still, we used the Echo Spot in the kitchen for a few days and forgot just how small it was - because it's a pretty big sound. As a bedside device it's been fine, better than your average clock radio, assuming you didn't go for one of those Bose models. As with all Echo devices you'll be able to request music from major sources - such as TuneIn or Spotify - in addition to Amazon Music. The Echo Spot also appears as a Spotify Connect device so you can control that music with your phone; you can also tell other devices to play music on your Spot, if you wish. Most will buy the Echo Spot for its visual dimension, which it borrows from the Echo Show, albeit in an adjusted and circular format. It brings a new dimension to convey information all the time - not just a clock, but the weather, your calendar or information about the song you're listening to. This makes it a welcomed beside companion because you can glance and take in what the day has to offer without immediately picking up your phone. You can also use the Echo Spot to watch video clips, although we're not sure who would do this. In the age of connected smart home devices, you can also use it to view compatible connected cameras, for example, your Ring Video Doorbell. While Amazon Video will play directly on the Echo Spot - and you can choose to watch it in the round format or a more regular aspect, it's so small you'd be better off watching it on your phone. The other dimension is Alexa Calling. The Echo Spot is one of two Echo devices that supports video, the second being the Echo Show. Here the cute round screen makes it a bit of fun and calling a distanced loved one via Alexa is a nice touch, because you can also do this from the Alexa app, so if you're lying in your hotel bed at night you can have a late-night chat. You could just use FaceTime or WhatsApp, of course. The other element is Drop In. This is an Alexa feature that essentially calls the Spot (or Show) and gives the recipient a few moments to compose themselves before the screen clears and all appears. This is where having a video camera next to your bed might raise some privacy concerns: what if your mother "drops in" while you're busy doing something you don't want mother to see? Of course, it all depends where you have your Spot - if it's in the front room on a coffee table, you might be perfectly happy to let anyone Drop In. Hitting the mute button will stop all video and sound being sent from your device, but you can still receive calls. In this case your mother will be saying "hello?" but won't see or hear anything that's going on. Of course you can control Drop In in the settings and if it's a concern of yours, you can turn it off or limit to just your household. As you can Drop In from your phone, you can also have a look around your house when you're not there. The Spot is hardly a security camera, but it's another eye into your house. Finally - and the video aspect we use the most - is intercom calling. You can just ask your Spot to call your Echo Show or other Echo device so you can talk to other people around the house. We've used this a surprising amount and it works pretty well. The real magic is Alexa, but at what cost? We're fans of Alexa and that should be clear. From fairly mindless trivia and playing music, Amazon's voice-assistant has evolved into one of the most important AIs of the last few years. Alexa can control your smart home and report information that's personal to you - and everyone is enjoying that. Placing the Echo Spot next to your bed means there's local function - times and alarms - as well as those global Alexa controls. Sure, you can now use voice control through any app - just as you can through the rival Google Assistant platform - but for many, being able to say "Alexa, show me my Ring camera" or "Alexa turn off all the lights" is the real draw. More so than a phone, because anyone in your bed can control Alexa. If you were to removed the Spot's screen you'd be back to Echo Dot territory, which is why the Spot is that much more expensive, at £119, compared to the Dot, at £49.99. For the addition of a small display, that seems rather expensive - it's even more expensive than the new Echo. For those who don't want something as big or intrusive as the Echo Show, then the Echo Spot will give you the advantages of display, offer you video calling and the full Alexa experience. For a family room and multiple users in bigger spaces, however, the Echo Show is the better device. The Amazon Echo Spot hits a number of key areas: it's the best designed of the Echo collection, giving it immediate appeal. Whether in the bedroom, on a kitchen worktop or side table in the living room, the Spot fulfils its role as master of all. For us it's that bedside environment that fits most naturally, the Spot fulfilling that role of radio alarm clock with skills and connectivity beyond what the radio alarm clock segment has ever seen. While the Spot's price is a little high for what you get - mainly because it's so much more than an Echo Dot - it's in the realms of affordable for gifting, and an obvious addition for an Alexa household, especially if the Show is too large for your tastes. Simply put, we love the Echo Spot. It's Amazon's most unique Echo device to date. The biggest Echo, the Show is a large-screen device, which might make it more appealing for the full family. It's not exactly dainty by design, though, which is where the slightly cheaper Spot excels (while offering all the same features). Non-plussed about a screen and touch control? The Echo Dot is the cheaper, screen-free solution that'll work wonders for voice-control tasks. It doesn't sound or look as good as the Spot, but for the money the Dot is a great buy.